HOUSTON - Security in Houston, America's fourth-largest city, is tight ahead of Sunday's Super Bowl 51, though officials have vowed to support peaceful demonstrations against President Donald Trump's executive order restricting entry to the United States for travelers from some Muslim-majority nations. 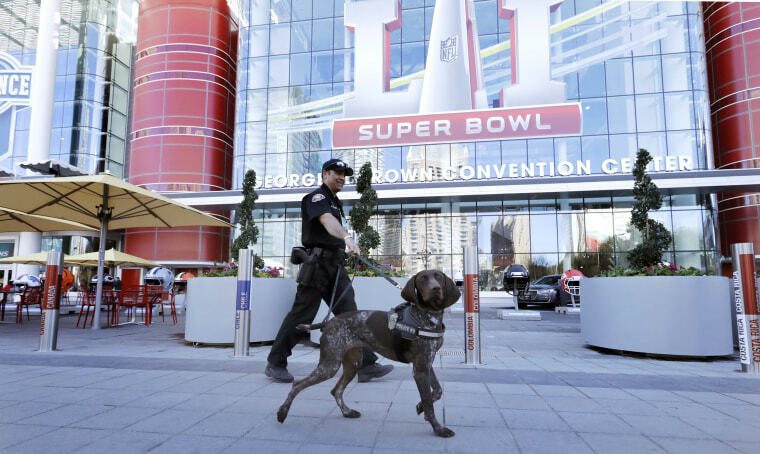 The approach by state, regional and federal U.S. security officials reflects a delicate balancing act as more than 1 million spectators are expected to flood into the Texan city as the New England Patriots take on the Atlanta Falcons. Protests against Trump's executive order on immigration have spread across the United States, including one last weekend in downtown Houston near where the National Football League has placed many pre-game activities. Protests are expected to continue throughout the week and into the weekend, even at the game itself. Halftime performer Lady Gaga has been an outspoken critic of Trump. Amidst the protests, officials said no credible threats to the city have emerged ahead of the game, which is expected to be watched by more than 100 million people around the globe. All members of the more-than 5,000-officer Houston Police Department will be on patrol alongside regional and federal law enforcement, officials said. "We have taken every possible precaution to keep people safe," said Houston Mayor Sylvester Turner, a Democrat who took office last year. Turner, who asked Trump in a series of posts on Twitter last weekend to rescind his immigration order, said he respected the rights of protesters and would support them so long as they remained peaceful. "Violence is not going to be tolerated or allowed," he said. The U.S. Federal Bureau of Investigation (FBI) has deployed commando-style SWAT (special weapons and tactics) teams ahead of the game, officials said, and is collecting and sharing intelligence information with local and regional officials. Security preparations have been more than three years in the making. "There is a large uniform presence, and there's also a large plainclothes presence," said FBI Special Agent Shauna Dunlap. "Maybe you might not recognize us, but we'll be there." Law enforcement officials said the concentration of Super Bowl-related events in only two areas, rather than several locations like last year in the San Francisco Bay Area for Super Bowl 50, had made security coordination easier. Metal detectors, bomb-sniffing dogs and myriad other security equipment have been deployed across downtown Houston and 7 miles (11 km) southwest at NRG Stadium, which will host the football game and about 73,000 spectators. Hotels have beefed up security as well. The Four Seasons, one of Houston's most-expensive hotels, has conducted active-shooter drills and added routine sweeps of plainclothes security throughout the facility. "We are prepared for the game," said Chip Fulghum of the U.S. Department of Homeland Security. "There are no known credible threats, but obviously this is a high-profile event." There have only been a handful of arrests thus far at pre-game events in the city, most of those for pickpocketing and trademark infringement, said Houston Police Chief Art Acevedo. "We're prepared to handle any eventuality and able to handle anything," Acevedo said.